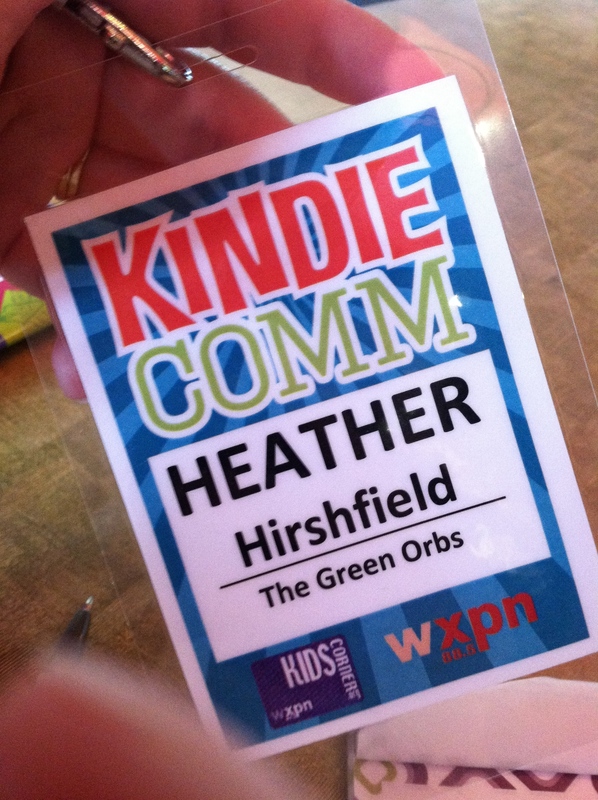 This past Saturday I spent the day in Philadelphia, PA at KindieComm 2014, a great gathering of musicians and other creative folk who are all somehow involved with the awesome world of Kid’s Music. I have to admit that I was a little nervous and apprehensive about going…..it is one thing to tell your family and friends that you are writing kid’s music and stories, but it is a whole different ballgame to be in a room with a vast group of people who all do the same thing! Just a little intimidating! I am so glad that my sister Emily agreed to be an honorary “Orb” for the day, since Eddie was away at a friend’s wedding. I definitely needed a “wingman”! When we walked in, we received our badges for the event. There is no better feeling than feeling that you belong somewhere, and after seeing my name on that badge, with The Green Orbs under my name, I knew that I was exactly where I was supposed to be, no matter how scared or nervous I was. The whole day seems like a big blur. There were presentations by Kathy O’Connell-the wonderful lady who made KindieComm happen- and Dan Zanes, plus I attended several break-out sessions that I found very informative and relative to everything that we have been doing. The real magic of the whole day, though, was getting to meet fellow Kindie movers and shakers. I was definitely shy about meeting new people, but I did manage to introduce myself to quite a few people and hear stories about their place in the Kindie universe. Everyone I met was unbelievably kind and very interested in hearing what The Green Orbs were all about just as much as I was interested in hearing about them. I loved that everyone there seemed to be supportive of one another. It really made me feel happy to be a part of this group! All in all, it was a wonderful day! I’m sad I did not get to go to the evening showcase….but it was my anniversary so I had to spend some time with my husband! (Happy 16th, honey!) I am really looking forward to next year’s event (Is it March yet?? ), and I am definitely going to be looking into if there are any other gatherings of Kindie artists throughout the year…anyone out there know???? KindieComm 2014, Here We Come!! The Green Orbs will be attending KindieComm 2014!!! We are so excited to meet and network with other people and bands creating cool stuff for kids! We can’t wait!! !